What if I'm a snowstorm burning? London: "What if I'm a snowstorm burning. What if I'm a world unturning What if I'm an ocean, far too shallow, much to deep. What if I'm the kindest demo, something you may not believe in. What if I'm a siren singing gentlemen to sleep"
"What if I'm a weeping willow laughing tears upon my pillow. What if I'm a socialite who wants to be alone. What if I'm a toothless leopard What if I'm a cheepless shepherd. What if I'm an angel without wings to take me home." A long time passed again, but we told you we are busy with studying, but of course we'll do our best to make time. We hoped you all had a lovely New Year and we wish you a lot of luck in 2013! About the song and quotes, I adore the song. You are just who you are and it's good. What if? It's a question asked far to much in my opinion. You have to take the things how they are and even though you can change them, you perhaps first have to ask yourself if it would be even better. What if I could could change my past? Of course it would be amazing, but why don't we look forward and hold on to our past so much. I think this song really expresses how I feel, the things can be good the way they are as long as you except them the way they are now. I get really happy if I listen to this song. Now about the look. It's colorful since I don't like too much dark colors in winter. It's like saying, this are dark and difficult times, but it can be wonderful and colorful too. I don't agree winter has to be dark and gray and brown. That why I did wear the colorful cardigan from Tidestore. Really perfect to cheer up an outfit. I combined it with a blue bowler hat and laced socks as final touch. Ow, I don't want to forget the amazing colorful wedges from NotRatedFootwear. I wore a black top and tights so I didn't wanted to wear a black skirt anymore, so I did choose this laced skirt from Chicwish. 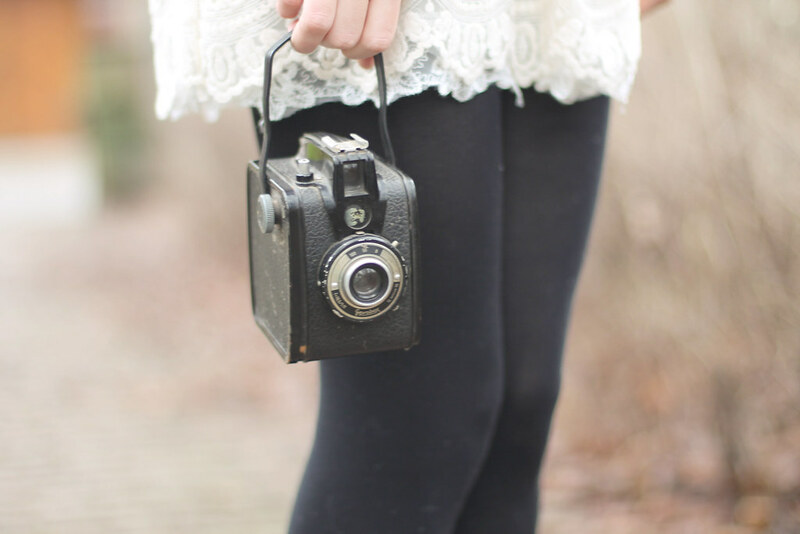 About the camera, it's vintage and we got if from our grandfather, it's truly amazing! It's so old. I hoped I could work, but I'm frightened they don't sell the 'picture rolls', but we'll try to search. Ow you perhaps already noticed I bought an Ipad mini. It's truly amazing. It's easy to use and I actually bought it because I brought my laptop to school all the time, but it's heavy and I don't want to break it since it's very fragile, and besides that I paid a lot of money for it -.-" so I wanted to take care. I really recommend it, if you ever doubt buying a tablet. I'm very satisfied and can share a lot more with you guys now! Loooove this outfit, the color choice is amazing ! I adore your skirt and your shoes. lovely look! love he hat and the skirt! I've been meanng to buy the ipad mini, but i already have the iPad, is it better than the iPad or not ? Your shoes!!! I love your camera too. So perfect.